By 1650 the apostolic pronotario Giovanni Battista di Filiberto, who also was internunzio of the Regno di Napoli, erected the building for his second-born son.It was in the habit to confer the aristocratic title and all inheritance to the eldest son, and to have the second-born trained as a clergyman. The building was later donated to Filiberto' s grand-children, and among them to Anton Francesco VALENTI, Bishop of Teodosia in 1727. It was he himself to found the prepositura VALENTI. Palazzo Valenti was also known as the Palazzino , and it was very important as a seat of a protonotoriato and a prepositura. 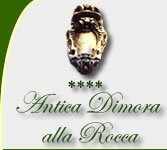 In the Curia it is the title of the members of the seven dignitaries college, assigned to the documents recording. The whole goods (lands and buildings estate) given to the second-born assigned to the ecclesiastical appointments.The returns of the goods had to provide for the church and the Rector. The volume of the building is of a great importance in the fabric of the city. It is set like a trapezoid as to the mountain and to Piazza della Rocca , of which it itself is the foundation. It has three floors, included the noble floor and the mezzanine floor. Vault rooms are in the basement. The face is a plain and simple architecture of elements, symmetrically placed around the lintelled door. All the windows are lintelled and vaulted, and have the superior frames engraved with witty remarks such as Vince in bono malu(m), Virt(us) unita forti(tudine); P(er) cruce ad sydera; on the main lintel it is engraved the motto FIDES, VIRTVS, INGENIVM, FORTVNA ad syde(r)a tollu(n)t (you could win evil with good - courage and valour - trough the cross to the stars - faith, courage, intelligence and luck lead to the stars). The interior too has the typical architecture of the XVII century, sober and classical. In the ground floor there is a vaulted corridor leading to the stairs that reach the superior floors. Plain pilasters, frames and vault ribs mark the internal space.Elliptical caps cover the landings. The noble floor is divided in simple rooms with plain ceilings adorned with painted beams. Some of the rooms keep sober paintings of the late XVIII century, similar to those kept in some ancient buildings in Foligno. An ashlar runs down the corners of the building. Some other rooms ceilings are adorned with XIX century paintings, representing images of mythology and vegetal patterns, typical of the period. The so called Palazzino is a precious element of the local history, and an evidence of such an important noble family of Trevi, as the Valenti family was. In the D.L. 09/10/1995 the Department of Beni Culturali e Ambientali declared that this building is of great importance, according to Art. 1-3 of the 16 1939 n° 1089 law and must therefore be protected. Book here your romantic weekend!